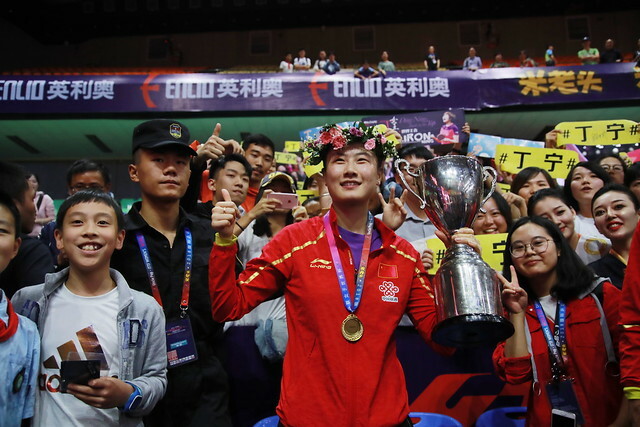 A first appearance; for DPR Korea’s Kim Song I on the morning of Friday 28th September, it was a successful debut in the Chinese city of Chengdu at the 2018 Uncle Pop 2018 ITTF Women's World Cup. Likewise as play in the initial group stage of proceedings commenced, there were wins for Canada’s Zhang Mo as well as for the Romanian duo of Elizabeta Samara and Bernadette Szocs. The win recorded by Kim Song I was the one result contrary to status; the no.18 seed, she accounted for Li Jie of the Netherlands, the no.9 seed, in five games (11-6, 7-11, 11-3, 11-8, 12-10). However, the outcome could not be considered an upset, earlier this year when they met at the Liebherr 2018 World Championships in Halmstad, Kim Song I had prevailed. A repeat performance by Kim Song I, it was the same for Elizabeta Samara. In April at the ITTF Challenge Croatia Open, in the second round of the Women’s Singles event, Elizabeta Samara had beaten Egypt’s Dina Meshref in seven games (11-13, 11-6, 16-14, 4-11, 12-10, 7-11, 11-6); in Chengdu, the contest was just as close, in fact even closer. Elizabeta Samara, the no.10 seed, came perilously close to defeat in the sixth game; she saved two match points before emerging successful (11-9, 8-11, 3-11, 9-11, 11-4, 13-11, 11-7). Success for Elizabeta Samara against the no.17 seed and a sigh of relief; on the Seamaster ITTF World Tour in August in Bulgaria and the Czech Republic she had experienced defeat in the opening round, on both occasions losing to China’s Wen Jia. Last week in Alicante at the Liebherr 2018 ITTF European Championships, she had suffered the same fate when opposing Ukraine’s Margaryta Pestotska. Conversely, fo Zhang Mo it was a very different to the most recent experience. In April at the quarter-final stage of the Women’s Singles event at the Gold Coast Commonwealth Games, the Canadian had overwhelmed Australia’s Jian Fang Lay in four straight games. In Chengdu, the no.11 seed, she needed the full seven games to overcome the pen-hold grip skills of the no.20 seed (6-11, 11-8, 9-11, 11-9, 11-8, 8-11, 8-11, 11-6). Hard earned wins for Zhang Mo and Elizabeta Samara; for Bernadette Szocs, life was less dramatic. The no.12 seed, she beat Wu Yue of the United States, the no.19 seed, in five games (11-6, 11-, 11-9, 9-11, 11-9). Play in the initial phase continues later in the day.